eC-placer is a camera-assisted manual pick and place device designed and priced for prototype and small series assembly. eC-placer speeds up component placement and in combination with our other eC-equipment gives significant savings in time and costs. 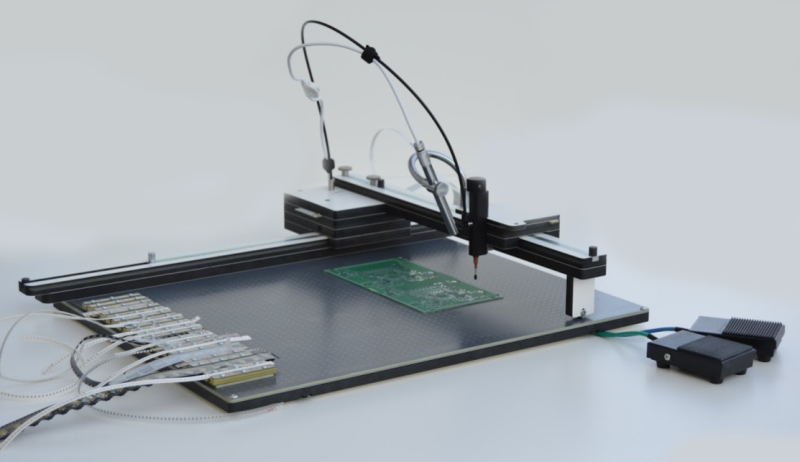 eC-placer's robust construction ensures long-term accuracy and repeatability. The machine is fast to set-up with 23 adjustable feeders included for component tapes and sticks. The combination of clear imaging from the high-definition camera and ergonomic design enhances productivity and minimizes operator fatigue. Two special placement modes boost speed and accuracy. 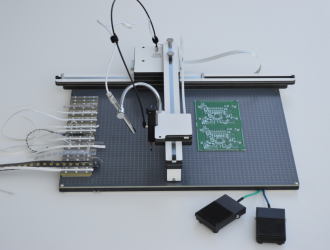 The Array mode provides a fast solution for placing a row of components. 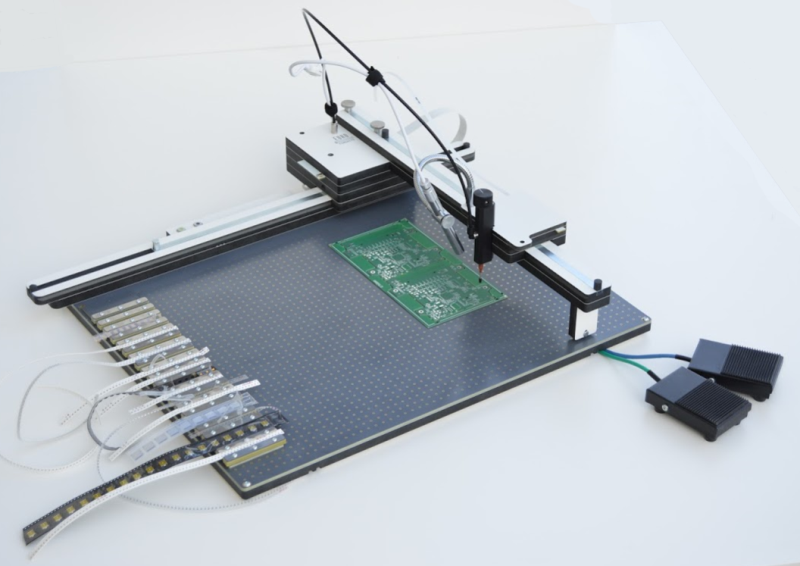 The Copy-paste mode uses a standard steel stencil to accurately locate BGAs, FPGAs and other complex components which are difficult to place by eye alone. 1. ESD-safe X - Y table with 10 mm pitch eC-registration-compliant location holes. 3. Precision mechanics with X, Y and Z movements and vacuum head component rotation. 6. Right- and left-handed set-up. Left-handed set-up is a mirror of the right-handed set-up. The changeover is straightforward and can be completed in 3 - 4 minutes. 7. Vacuum placement head with quick-change nozzles for different size components plus rubber heads for larger components and ICs. Four nozzles and 3 suction cups are included as standard. 9. Two foot-pedal controls: one for the vacuum, and one for the X- and Y-axis programmable stops. 10. High-definition USB camera with parallax compensation for different heights between feeder and PCB. 11. Powerful LED light for illumination and cross-hair component location. 12. Camera can be linked to any Windows-compatible PC (not included) to display exact component position during pick-up and placement. 13. Feeders are included for component tapes and component sticks. The feeders are easily adjusted for different widths (8 mm, 12 mm, 16 mm etc.). The table will accommodate up to 23, 8 mm tape feeders. 14. Smallest component size 0402 (1 mm x 0.5 mm). 15. The work-table is ESD-safe when grounded (grounding point included). Components can be placed safely anywhere on the table. 16. A bonding point is included to link anti-static wrist bands to machine ground. An eC-ESD-kit is available as a separate item from our eC-consumables shop. This includes an eC-ESD-wrist-strap, eC-ESD-grounding cord and eC-ESD-plug. 17. Maximum board size on table: 500 x 350 mm. Maximum board size with feeders: 460 x 350 mm. Maximum board size when using "copy-paste" template: 350 x 250 mm. 18. 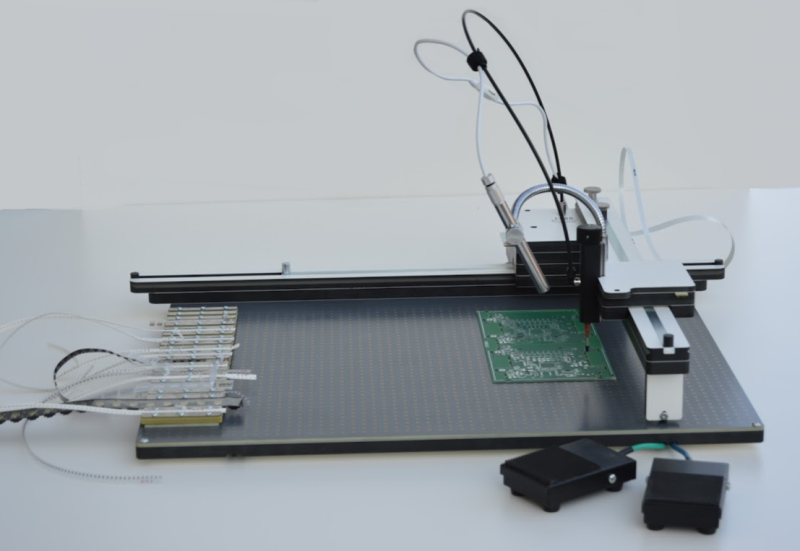 10 eC-registration-compliant PCB location pins and 4 stencil/template location pins included. 19. Power input (excluding computer): 90 - 264 V AC; 47 - 63 Hz; 24W. Accepts EU-standard plugs including UK 3-pin. Wonderful! Only 1 question: does the placer contains own compressor?